Dr. Russell Kridel served as a Guest Editor for this month's issue of Facial Plastic Surgery, the Official Journal of the European Academy of Facial Plastic Surgery which focused upon Ethnicity in Facial Plastic Surgery. 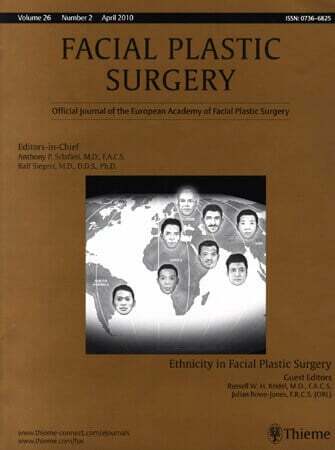 In this issue surgeons explore special considerations such as preserving or modifying the facial features of different ethnic groups, and discuss the challenges and questions for these various concepts of ethnicity and of modern and changing standards of aesthetic beauty. Rhinoplasty is currently the most popular facial plastic surgery procedure requested by Hispanic and African-American patients. Traditional procedures and techniques have evolved to favor more ethnic preservation. In two articles “African-American Rhinoplasty” and “Hispanic-American Rhinoplasty”, Dr. Kridel details how surgical planning shoud be sensitive to both individual and cultural differences in aesthetic perception and the patient's expectations. Kridel, RWH, Rowe-Jones J: Guest Editors. Ethnicity in Facial Plastic Surgery. Facial Plastic Surgery. Thieme Medical Publishers, 2010; 26 (2). Kridel, RWH, Patel, A. “African-American Rhinoplasty” In Ethnicity in Facial Plastic Surgery. Facial Plastic Surgery. Thieme Medical Publishers, 2010; 26 (2): 131-141. Kridel, RWH, Patel, A. “Hispanic-American Rhinoplasty” In Ethnicity in Facial Plastic Surgery. Facial Plastic Surgery. Thieme Medical Publishers, 2010; 26 (2): 142-153.